from a pallet or skid. layers of product are added or removed. Encloses underside of lift table, protecting the lift mechanism from dirt and debris. 6” (152 mm) corrosion resistant urethane casters for mobility (2 locking swivel casters and 2 non-locking, swivel casters). Adds 7.5” to all heights on standard fork pocket model. Four adjustable threaded rod feet can be independently adjusted to maintain levelness on uneven or damaged floors. 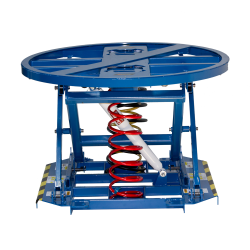 Our circular steel tabletop is ideal for use with damaged or oddly sized or shaped pallets or skids and replaces the open turntable. This circular stainless steel tabletop is perfect for hygienic applications. Ideal for use with damaged or oddly sized or shaped pallets or skids and replaces the open turntable. Solid steel rectangular tabletop matches standard pallet dimensions. Replaces open turntable; ideal for wood and plastic pallets.